Welcome to the website of Elegancia del Caribe Apartments. Welcome to Elegancia del Caribe Apartments, conveniently located along the quiet boulevard at the Kralendijk bay where sailing yachts moor in the quiet waters of the Caribbean Sea. These oceanfront apartments are fully furnished for a great vacation, be it for diving, surfing, snorkeling or just relaxing. The Sunbelt Realty rental team invites you to contact us for answers to any of your questions or to prepare your reservation right away! Once you are on island you will find that our expert team is your trusted partner to further ensure you a great vacation. In addition we can arrange rental cars, dive packages and so forth for you. In the heart of Kralendijk, Bonaire’s beautiful capital, you will find this stunning, oceanfront residence. 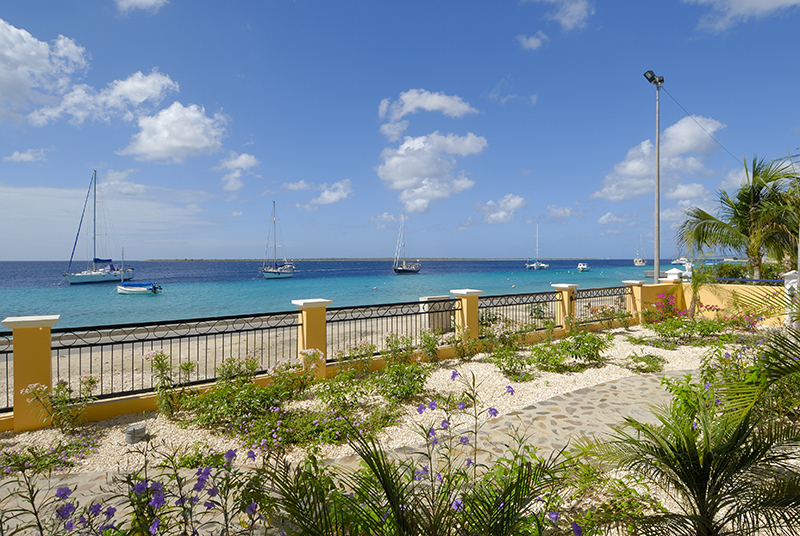 Staying at Elegancia del Caribe will offer you the best of Bonaire! Luxurious, oceanfront two bedroom – 2 bathroom apartments, walking distance from shops and restaurants and great diving and snorkeling right in front of the building. To cool down; just jump into the swimming pool or relax at the large pool deck. Please browse the menu above for further details.